I randomly came across this blog yesterday through my Pinterest page, and I'm just loving all of this girl's refashioning ideas! 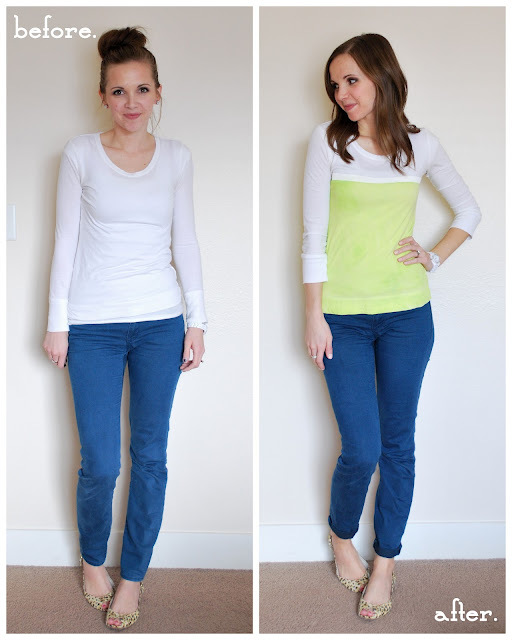 She takes old clothes and makes them new again - and shows you how she does it through her blog. SO awesome. 1. Learn to use your sewing machine. This is huge for me. Your clothing will most likely look homemade if you are just tying knots, or gluing things on. You only need to know the basics of sewing for most refashion projects, but doing real seams will make a world of difference in making your clothing look professional. 2. Utilize Pinterest. There are so many amazing ideas on there, but not just DIY projects. Most of the things I make or refashion come from outfits I see models or other bloggers wearing. An idea is usually sparked when I see a model wearing a shirt with a similar color or pattern to a shirt I already own, and from there I can figure out how to manipulate my shirt to look like the models'. 3. Make a "repair box" and then go through your closet and put everything in there that you don't wear. Going through your closet one piece at a time lets you know what you have to work with when refashioning. Then when you see a refashioning idea, you know exactly what you own and how you can use it to make a piece you love. Also, work on each piece in the repair box one at a time. Seeing each item individually can help the task seem easier. Attacking your whole closet at once will get overwhelming really fast. Some of my clothes have only needed a simple seam for me to love them again (baggy sleeves are a big one for me...I've taken in so many sleeves and suddenly the cardigan or shirt fits me like a dream and makes me love it again). 4. Clean out your closet. I have a strict policy that I don't keep anything in my closet that I don't like and won't wear. I either get rid of it or put it in the repair box. Having a big closet full of clothes that I don't like makes me unhappy. Who cares if you have a lot of clothes in your closet if you hate them all? It's okay if your closet is small if you love and will wear every single item in there. 5. Don't be limited to your closet only. Utilize your husband's (or boyfriend, or brother) old clothes, if he's going to get rid of them. I did that with my polo refashion, and it's now one of my favorite tops. Also, there may be lots of potential in cheap thrifted items -- taking in the sides or hemming the bottom can often make an awful piece into an amazing piece. 6. Accept the fact that some clothes are not fixable. I've sent plenty of shirts to Goodwill, or thrown them away, because there is nothing I can do with them (after I've tried). Don't hang on to it forever, hoping that it will somehow get new life, or it will become a thorn in your side or a wet blanket for your creativity. Sometimes you just have to throw things away. It's okay. 7. Learn how to layer. Pinterest is another great guide for this, as are fashion blogs. Style is about putting pieces together in interesting and creative ways. If you learn how to mix pieces, you have endless outfit possibilities, even if you're using the same pieces over and over. Use belts, scarves, cardigans, and tights to mix and match your clothing, and make it feel new and fresh. I've had some of the same pieces in my closet for years that I've always worn the same way, and suddenly when I layer them together, new interesting outfits are born. 8. Re-purpose. Put a shirt on over a dress, and turn that dress into a skirt for a day. Or the opposite -- put a skirt on over the dress and turn it into a top. Use a thin scarf as a belt, or a headwrap. Wrap long necklaces around your wrist to create the look of several bracelets. When you start thinking outside of the box, style and creativity start developing. 9. If you can, buy something new every once in a while. Having a new piece in your wardrobe can spark new ideas, make a bunch of new outfits, and make you feel like your closet is staying current. I love love LOVE tip #8 about re-purposing things that you wouldn't wear in a "typical" way - sometimes I struggle to think outside of the box for sure. Check out Merricks Art here, and send her some love! Her style is super duper cute, and she has some really amazing & creative ideas. I really want to go through my closet and give it a facelift, especially since I can't go shopping due to my Spending Fast. Not only is this method FREE, but it's totally green! I LOVE THAT! All photos from Merricks Art blog. I love my family and friends more than anything! I'm livin' life in the beautiful mile-high city of Denver, CO. I'm back in school for nutrition, and I LOVE trying (and sharing) new recipes. I adore bright colors, dressing up, laughing, roller derby, experimenting with makeup, cooking, acting like a kid, snowboarding, music, traveling and surprises. Life is pretty darn good. VK MADE Quilts: My Newest Endeavor! Corey Feldman wants you to have a happy Thursday. Do "I'm Failing" Stories Make Us More Likeable? Spending Fast Update - 6 months down, 6 to go! Moving on - Living life! Change Your Life. Ride A Bike! Let's Go Ride a Bike - life on two wheels: simple. stylish. fun.